Bill Heine's house with The Headington Shark in Headington, Oxford, England. American-born, Heine lived in Oxford since studying for a postgraduate degree at Balliol College in the late 1960s. In the 1970s and 1980s, he ran both the Penultimate Picture Palace cinema in East Oxford and the Moulin Rouge Cinema (which he later renamed Not The Moulin Rouge) in Headington. Bill and his friend, the sculptor John Buckley designed a giant pair of hands to adorn the former, and a giant pair of legs for the latter. Headington is an eastern suburb of Oxford, England. It is at the top of Headington Hill overlooking the city in the Thames Valley below. The life of the large residential area is centred upon London Road, the main road between London and Oxford. John Buckley is an English sculptor whose best known work is the sculpture "Untitled 1986", better known as "the Shark House" or "The Headington Shark" in Headington, a suburb of Oxford. The Headington Shark is a rooftop sculpture located at 2 New High Street, Headington, Oxford, England, depicting a large shark embedded head-first in the roof of a house. Acute myeloid leukemia (AML) is a cancer of the myeloid line of blood cells, characterized by the rapid growth of abnormal cells that build up in the bone marrow and blood and interfere with normal blood cells. Symptoms may include feeling tired, shortness of breath, easy bruising and bleeding, and increased risk of infection. Occasionally, spread may occur to the brain, skin, or gums. As an acute leukemia, AML progresses rapidly and is typically fatal within weeks or months if left untreated. 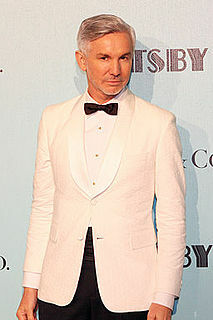 Baz Luhrmann is an Australian writer, director, and producer with projects spanning film, television, opera, theatre, music, and recording industries. He is regarded by many as a contemporary example of an auteur for his distinctly recognizable style and deep involvement in the writing, directing, design, and musical components of all his work. He is the most commercially successful Australian director, with four of his films in the top ten highest worldwide grossing Australian films of all time. Armando Giovanni Iannucci is a Scottish satirist, writer, director, and radio producer. Born in Glasgow to Italian parents, Iannucci studied at the University of Glasgow followed by the University of Oxford, leaving graduate work on a D.Phil about John Milton to pursue a career in comedy. Starting on BBC Scotland and BBC Radio 4, his early work with Chris Morris on the radio series On the Hour transferred to television as The Day Today. A character from this series, Alan Partridge, co-created by Iannucci, went on to feature in a number of Iannucci's television and radio programmes, including Knowing Me Knowing You with Alan Partridge and I'm Alan Partridge. Iannucci also fronted the satirical Armistice review shows and in 2001 created his most personal work, The Armando Iannucci Shows, for Channel 4. BBC Radio Oxford is the BBC Local Radio station for Oxfordshire, UK. Oxford United Football Club is a professional football club based in the city of Oxford, Oxfordshire, England. The team plays in League One, the third tier of English football. The chairman is Sumrith Thanakarnjanasuth, the manager is Karl Robinson and the team captain is John Mousinho. Anthony Minghella, was a British film director, playwright and screenwriter. He was chairman of the board of Governors at the British Film Institute between 2003 and 2007. BBC Southern Counties Radio was the BBC Local Radio service for the English counties of Surrey and Sussex. The station also covered a large part of North-East Hampshire. It was the first BBC Local Radio station to introduce an all-speech format. It broadcast from its studios in Brighton and Guildford on FM, AM and on DAB on the NOW Sussex Coast multiplex. BBC Radio Berkshire is the BBC Local Radio service for the English county of Berkshire, North Hampshire, and South Oxfordshire. Radio Berkshire broadcasts on 94.6 (Henley-on-Thames), 95.4 (Windsor), 104.1 (Hannington) and 104.4 (Reading) FM from its studios at Thames Valley Park near Reading. The station is also available on DAB, Freeview, and through live streaming on the internet, also on demand for thirty days after broadcast through the BBC iPlayer. Oxford East is a constituency represented in the House of Commons of the UK Parliament by Anneliese Dodds of the Labour Party. John Spurley Challis is an English actor best known for portraying Aubrey "Boycie" Boyce in the long-running BBC television comedy series Only Fools and Horses and its sequel/spin-off The Green Green Grass. Since 2015, he has made guest appearances as "Monty Staines" from the seventh series onwards in the hit ITV comedy Benidorm, later becoming a regular from series 10 in 2018. Bill Buckley is a radio and television presenter and former actor. For three years, he was a co-presenter of BBC Television's consumer affairs programme That's Life!. He currently presents on BBC Radio Berkshire and has presented shows on BBC Radio Solent, BBC Southern Counties Radio, BBC Radio Devon, BBC Radio Oxford, London talk radio station LBC 97.3, BBC London 94.9 and numerous others. Bruce Woolley is an English musician, singer, songwriter, and record producer. He wrote songs with artists such as The Buggles and Grace Jones. Marc Elliott is an English actor from Stratford-upon-Avon, England, who is known for his role as Syed Masood in the BBC television soap opera EastEnders. The city of Birmingham, England is home to an evolving media industry, including news and magazine publishers, radio and television networks, film production and specialist educational media training. The city's first newspaper was published in 1732. Deadly... is a strand of British wildlife documentary programming aimed principally at children and young people, which is broadcast on CBBC on BBC One and Two and on the CBBC Channel. It is presented by Steve Backshall, with Naomi Wilkinson as co-host on Live 'n Deadly, and Barney Harwood as co-host on Natural Born Hunters. The strand began with a single series known as Deadly 60, and has subsequently expanded into a number of spin-offs, re-edits and follow-up versions. The Ultimate Picture Palace is an independent cinema in Oxford, England. It is Oxford's first and only independent cinema, showing an eclectic mix of independent, mainstream, foreign language, and classic films. Secret Cinema specialises in "live cinema" experiences, combining film screenings with interactive performances in purpose-built sets. It was founded in 2007 by Fabien Riggall, as a subsidiary of Future Shorts Ltd.. This is a list of events taking place in 2019 relating to radio in the United Kingdom. ↑ "Presenter Profile: Bill Heine". BBC News . Retrieved 26 November 2012. ↑ "Bill Heine". BBC Radio Oxford. 24 April 2016. Retrieved 1 July 2016. ↑ "Cinema, New High Street". Headington history: Miscellaneous. Retrieved 26 November 2012. ↑ "In praise of... the Headington shark". The Guardian. 9 August 2007. Retrieved 3 April 2019. ↑ Heine, Bill (2011). The Hunting of the Shark. Oxford: Oxfordfolio. ISBN 978-0-9567405-2-6. Archived from the original on 2015-12-08. ↑ "Bill Heine: 'Doctors have given me 18 months to live - and I've already had three of them'". Oxford Mail. ↑ "Tributes flood in after death of Oxford's Bill Heine". Oxford Mail. This BBC Radio–related article is a stub. You can help Wikipedia by expanding it.